This year, I seemed to have dropped the ball on posting holiday recipes. I had it all planned too! Back in January, I took my nifty calendar and scribbled possible posts and recipe ideas, I pencilled in relevant holidays and even some obscure ones like St David’s Day, who unlike St Patrick, doesn’t get quite the same recognition. For those of you not familiar with him, he’s the patron saint of Wales. However, I did remember Star Wars Day 🙂 A day circled in very bold on all calendars at home. I wasn’t planning on sharing this post until next week, but as Mother’s Day is coming up this weekend and I still haven’t picked up that darned ball, I decided to post this early. It’s quite a fitting cake for Mother’s Day even though it was made as a birthday cake for my husband a couple of weekends ago. You might also be thinking that it’s a bit of a froufrou cake for a man, and believe me, what he really wanted was a replica of the Starship Enterprise as his cake. A request I would have fully entertained if it wasn’t for the jam packed status of the weeks leading up to his birthday. Model cakes take a long time to make, ask anyone who has made one! I told him it’s still on my list and it may materialise for Father’s Day; we’ll see. So, why the Tres Leches? Because it’s only the best cake ever! It’s also known as a three milks cake and it originates from Central America. Of course, it’s thought that it came to them from trade and travel in Europe. Whatever the origin, this cake is incredibly popular in Texas, which is where we came across it. Typically, you will see this cake baked in a glass dish and the milks are poured over and then frosted. However, it can be layered and made to look like a special occasion cake. Infact, my sister had a three tier Tres Leches for her wedding cake, and a new tradition was born. We continued the tradition by getting all of the kids’ birthday cakes from a local panaderia, and they did such an excellent job making it to any theme we wanted. Laith’s 2nd birthday, they did a full sheet cake in the Cars theme. It was so adorable. Tradition continues with all the extended family now getting their Tres Leches wedding cakes and their kids’ birthday cakes from the same panaderia. It’s not like we can’t get it here in Colorado because we have quite a thriving Hispanic and South/Central American community. It’s just that I don’t feel like looking for a panaderia and then driving down to get it. I have adopted the Colorado mentality of “if it’s not down the end of my street, I’m not going” which I think is just a ploy to not have to go on I-25. It’s a mentality I was surprisingly quick to adopt considering that I came from Houston where unless you have travelled on 3 State Highways and 2 Interstates just for lunch, you haven’t travelled! What is a Tres Leches cake? It’s an airy, dry sponge cake that is soaked in three milks, usually evaporated, condensed and heavy cream. It is then chilled overnight, and then frosted with either a meringue topping or fresh whipped cream. It is not a low calorie food. Unfortunately, it’s an addictive food. I made mine a little different form the traditional ones you see on the web. Most of them are single layer, in a glass pan covered in cream. You do not see how wonderful this cake is when you serve it like that. It needs to be elevated to the top of the special occasion cake category with a bit of effort. I filled mine with macerated fresh strawberries, and since I couldn’t find an organic evaporated milk can or at least a can with no additives, I chose to forgo it and use half and half. It was perfect. It was moist enough to be recognised that it was soaked in 3 milks and sturdy enough to not collapse under the weight of the 3 milks. There’s still time to make this for your mum! It only needs a day to chill overnight and an hour to ice. You can always just make it in a baking dish and cover it with cream. 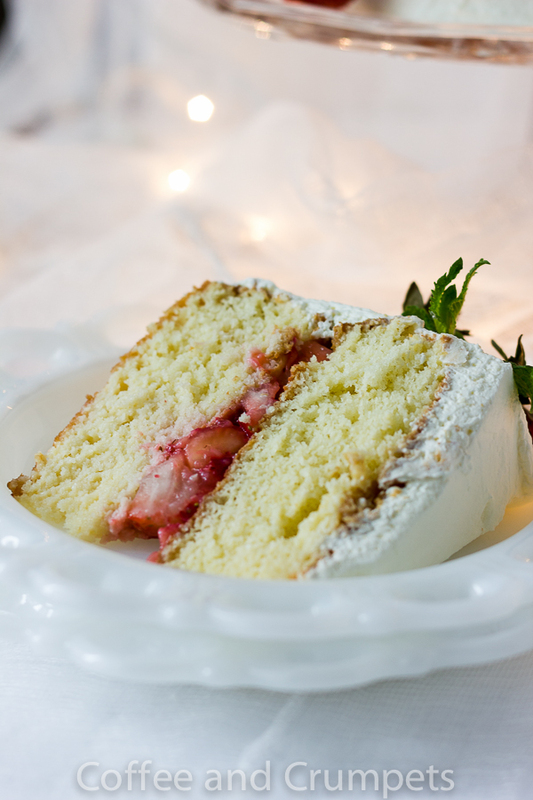 A moist sponge layer cake filled with macerated strawberries and soaked in three milks. Plan to make the sponge cake a day ahead so it can thoroughly chill. Grease and line the bottom of the pans with parchment paper, 2 9 inch/24 cm cake pans. Using a mixer, beat the egg whites until soft peaks form. On high speed, gradually add the sugar. Add the flour, ½ cup at a time until well incorporated. Use a spatula to scrape down the sides. Add the ½ cup of milk until the mixture is smooth and evenly mixed. Divide the cake batter between the two prepared pans. Place in the oven and bake until golden brown about 25-30 minutes. Let cool in the pan on a rack for 10 minutes. Meanwhile, make the soaking milk. Combine the condensed milk, heavy cream and the half and half and mix well. Divide the milks over the warm cakes equally. Allow to soak into the cake. Place in the fridge to chill overnight. Mash the strawberries with sugar slightly so they release some of their juices. Beat the soft cream cheese with the sugar until light and fluffy. Add the heavy cream and whip until thick enough to spread on cake. You will need to beat it to quite thick but don't get carried away and make butter! Run a spatula or a butter knife around the edges of the cake. This will be a bit tricky and you will need to wiggle the edges of the cake and prise up the edges to loosen. The cakes are soaked with milk so they will not just fall out easily. A bit of patience and delicate handling is all that's needed. The parchment is important so don't forget to line the pan! Once you've taken out the first cake, place it on a cake plate. Spread the macerated strawberries and the juices over the bottom layer. Make it quite flat and even but don't take it too far to the edge. Jiggle out the second cake and place on top of the strawberries. If a bit of cake gets stuck and remains in the pan, it's not a big deal. It's soft enough to paste back onto the cake and spread out. You can do a crumb coat with a little frosting or you can take thick globs of it and spread it around. The cake is not too crumbly but some parts tend to get stuck to the spatula. I suggest taking big globs of the frosting and spreading it on the top first and then working the sides. Always use a lot of frosting, the crumbs will stick if you're using too little. Smooth out or leave it rustic looking with swirls and peaks. 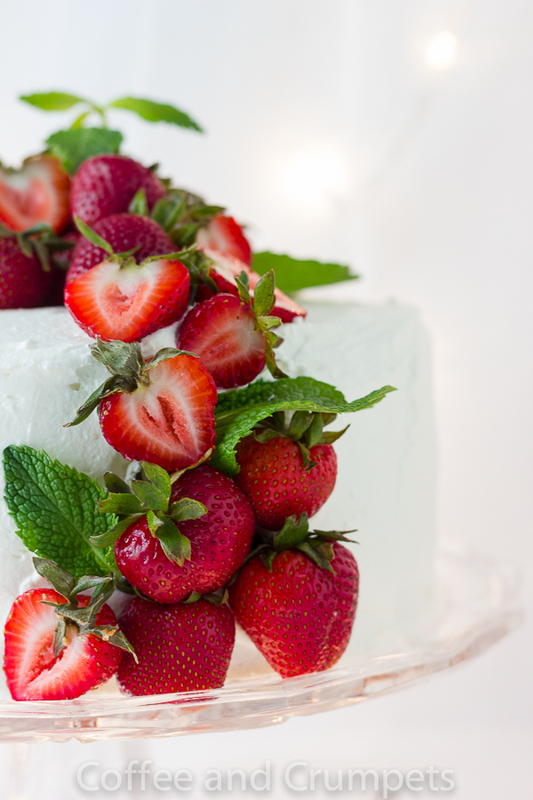 Decorate the top with more fresh berries and mint leaves if desired. It is normal for some milk to seep out when the cake has been sitting in the fridge for a while. This cake can be baked in a 9 x13 (24cm x 33 cm) glass dish but reduce the temperature to 325F. This won't have any filling but you can serve the fruit on the side or use it as a topping. You probably won't need all the frosting either. So, here is my contribution to Mother’s Day. I will try and work on catching that ball so I can better represent some holidays here! Next up will be the Islamic month of Ramadan that will be here at the end of June. There’s always good eats during Ramadan which is interesting considering it’s a month of fasting! I will wish all the mums out there a very Happy Mother’s day for Sunday and especially to all the new moms celebrating their first Mother’s Day. Have a wonderful weekend with your mothers and your loved ones. What a gorgeous cake, Nazneen! 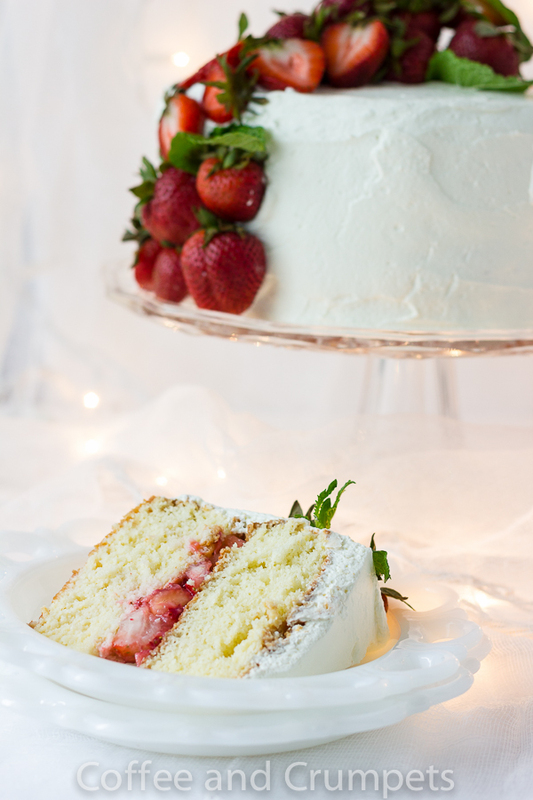 The strawberry topping is beautiful – the way it runs from the top to the side…very elegant look! Tres leches cake is so good! I wish to have a homemade version as I only had it in restaurants…. Pinning this gorgeous cake! Nazneen, 3 leches cake is my husbands favorite. Must try out your recipe for this classic, it looks so elegant and beautiful. Nazneen, this cake is simply beautiful. Wow Nazneen! Just… wow… that cake is visually… stunning! I don’t even care what it tastes like – it just looks amazing. You’ve done an absolutely fantastic job. It’s like something I’d see in a fancy cake-shop window, seriously. I love the strawberries “tumbling” down the side. Altogether though it looks like an amazing cake – well done – love it! OMG! Nazneen this cake is a masterpiece… it so beautiful and elegant… The frosting you did is perfect. I really hope that your husband appreciated it! Happy belated birthday to him. I hope you had a great Mother’s Day as well…. I saw some pictures on FB, you still have snow???? A huge hug, take care. I’m practically speechless (which, you may have surmised, is incredibly rare! 😀 ). I love, LOVE tres leches cakes! Turning it into a layer cake? Brilliant! Adding macerated strawberries? Beyond brilliant! These photos? Ummmmm … better than words. Insanely great post, my friend! Wowwwweeeee. This looks amazing. I’ve never made a tres leches cake before but I really want to! Your icing is absolutely perfect by the way. I love how simple and elegant this looks! A beautiful and untraditional way to decorate with strawberries. Nazneen, I love tres leches cake – the moistness of these cakes is hard to beat but I also never attempted to make more than a sheet cake, never layers. Your cake sounds and looks divine – I am sure it received raving reviews, I would not mind receiving one for my birthday! What a beautiful presentation! I hope you had a wonderful Mother´s Day, dear friend! Now this is my kind of cake! It looks so beautiful with the cascading strawberries. Definitely something my mummy would love – I made her seafood chowder yesterday but perhaps I ought to follow-up with this! Whenever we go back to Florida to visit family, we always eat at one Cuban restaurant while there. My husband always orders tres leches for dessert. Your cake is not only the prettiest one I’ve ever seen but the flavor has to be excellent. I’m sure your husband was thrilled with his birthday cake. i guess all the effort is worthed for sure!!! 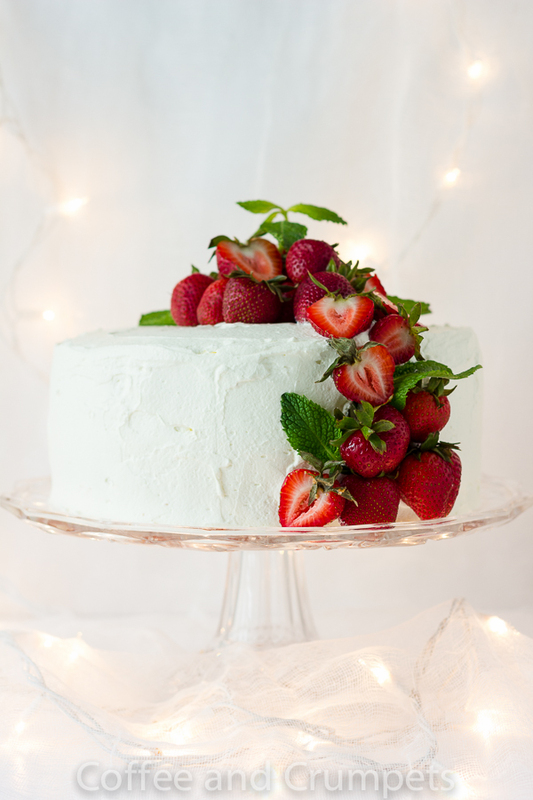 Yes, Nazneen, tres leches is one of my favorite cakes, and I always get it at the local Cuban bakery….but somehow I never attempted to bake one…yours look so pretty and it has such a great texture…so beautifully decorated. Nazneen, you have out done yourself. Beautiful. I wouldn’t be surprised if a magazine doesn’t offer you a job with that photo. This looks so good, seems a shame to cut into it! I can’t agree more with you – Tres Leches is indeed addictive. Your presentation is outstanding with those succulent, juicy fresh strawberries. Yumyum! such a simpel and beautiful cake, may make this for mothers day! Woow Mashaa Allah Nazneen, you are such a devoted and lovely wife… I hope my husband will not see this post or else ….. hahahaha. Happy birthday for your husband may all your days be filled with happiness and great cakes. You’ve made a heavenly cake for sure. Happy mother’s day to you dear. Amira recently posted..From Sudan : Al Aswad salad!! Wow! What a gorgeous cake! And I am sure it tastes as good as it looks. I do a coconut rum tres leches cake, but it isn’t as pretty as this one, though it sure tastes good. And you are right about Houston! My husband’s family calls it a giant freeway. Oh, Nazneen! Happy Mother’s Day! Abbe@This is How I Cook recently posted..Hearts of Palm, Avocado and Orange Salad or Have a Heart! This sounds dreamy, wonderful photos Nazneen! Happy mother’s day to all the mums out there! I LOVE this cake with your twist on it. And of course the bright red strawberries. Pretty as a picture! I have not been able to post my mother’s day cake yet…I feel overwhelmed with emotion when I begin to write (though I am finding it quite funny now:-)) My Mum is actually here by the end of May along with my sis so I am looking forward to have a ball. Wishing you a wonderful Mother’s Day Nazneen. Your children are lucky to have such an awesome mother who cooks amazing dishes for them. What a gorgeous presentation, Nazneen! You are a very good photographer. pretty good and some not so good. So….I guess I better make one myself! tres leches cake, just a dos leches cake and not as delicious. I’ll have to think that over. 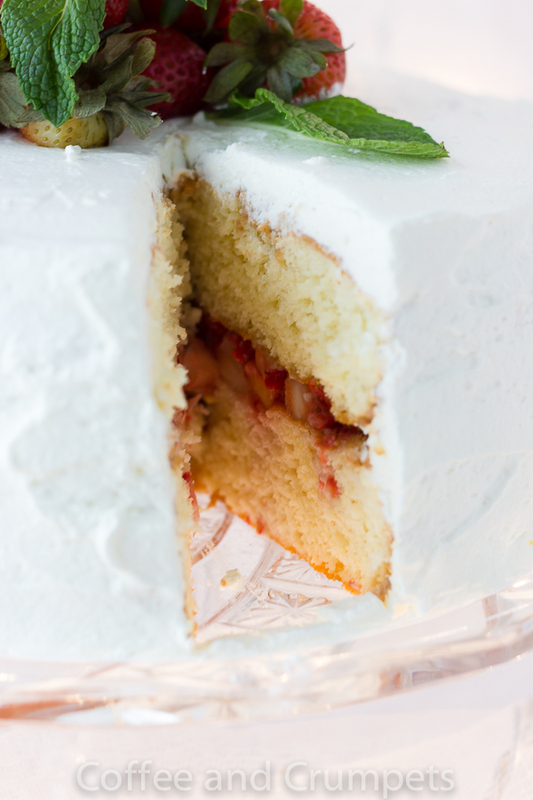 Have you ever tried using less milk so that the cake was still moist but didn’t get too soggy? Thanks Caterina. Organic condensed milk is available and that is necessary to make this cake. Condensed milk has a particular caramel flavour that is needed. The amount I have listed is what’s needed to make it moist and be able to be stacked. This cake is not soggy, it’s got the right amount, any less and it won’t be soaked enough. I haven’t had Tres Leche anything in ages and ages. This cake looks wonderful, and you’re so right that it’s perfect for Mother’s Day. Love the photos of this — thanks. I’ve never actually had a tres leeches cake, though I have seen them, and I can honestly say that I’ve never seen one as beautiful as this! Wow, you have totally outdone yourself daaaahling! Gorgeous presentation, Nazneen! Lucky Trace! I love how you stacked it – I have only had I in a sheet pan. I cover mine with dulce de leche! Four milks!! I wish you a very happy Mother’s Day, too! I only had three milk cake one time and I did not like it. The one I tasted was too sweet and wet. Your cake is stunning!! And it does not look wet like the one I tasted. 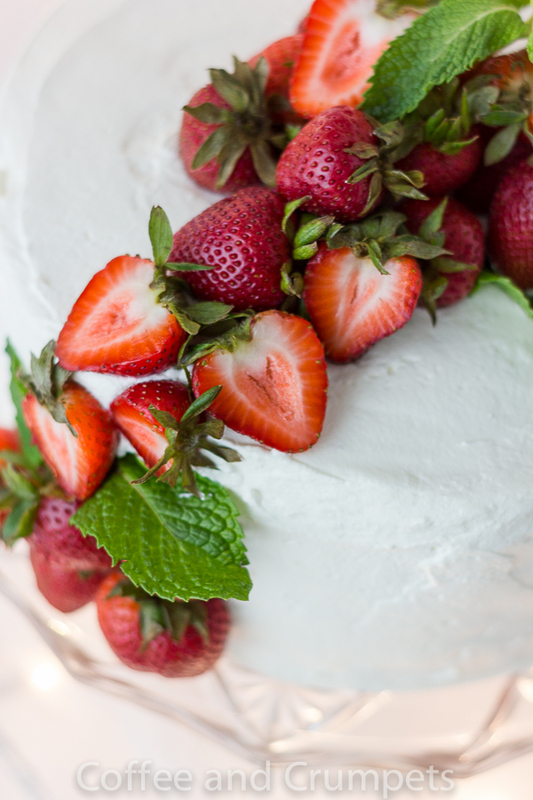 It is the perfect for mother’s day cake—beautiful with the draped strawberries and mint. I wish I could try it now! Nazneen – this cake LOOKS gorgeous and SOUNDS totally delectable! I don’t think I’ve ever had a layered tres leche before – BRILLIANT idea! Shashi @ RunninSrilankan recently posted..Oats for Eats… Eats for Oats…this WIAW! I LOVEEEEEEEEE tres leches cake! Your photos are absolutely gorgeous! The story is the same in my house, the guy hasn’t met a cake he didn’t like. :)) Beautifully done Nazneen. The cake looks gorgeous and yes, it just is the most delicious cake there is. Happy Mother’s day. You too Ansh!!! Hope you have a great weekend planned! Nazneen, what a beautiful cake! I can almost feel the moistness…..worth the calories, honestly! lol! One of my friends recently made me a big cake full of fruits and nuts. I possibly polished 60% of the entire thing. Worth every calorie I tell you, just worked harder at my Zumba class, hahaha! Only my most favourite cake, ever! I started the tradition of making it for my own birthday but this sadly lasted only a year or two. But, hey , no occasion is needed to make this gorgeous cake. Please excuse me while I go whip up a batch NOW. tres leches from a small Mexican grocery store is one of my favorites too..only last week I made it for work however, it didnt turn out great like I expected 🙁 your layered version looks amazing! Thank you Dixya! I was quite happy with it. I would love to have a piece of this gorgeous cake Nazneen! Your photos are more than gorgeous! Now I’m going to be craving tres leches cake until I bake this recipe and eat most of it. Thank you Karen! It’s easy to eat this cake, you crave it after a while! 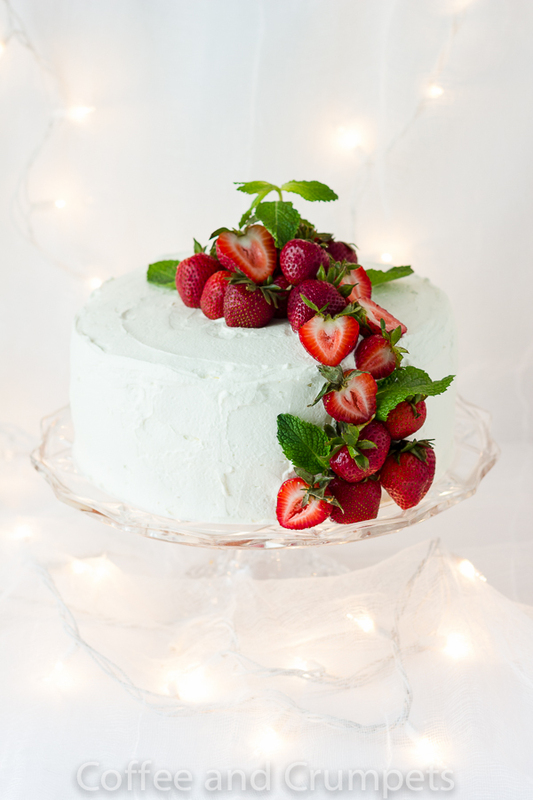 Nazneen: What a gorgeous cake…I have never seen a tres leches as beautiful as this one. I also love how you captured its beauty from several angles crowning with that slice of cake — which ,by the way, made me wish to have it in my mouth. I agree with you…It is a great cake for Mother’s Day! Wishing you a very Happy Mother’s Day, my dear! You have a fine talent of cake making, Nazneen. Looks superb. I’ve made a few cakes lately that need a syrup pouring over them which keeps it moist for a good few days. Does the tres leche have the same effect? Thanks David! Yes, the tres leches stays very moist but it does have to be refrigerated. With this layered version, as the leftovers sit in the fridge, the top layer begins to release it’s milk yo the bottom layer! A pan version is moist all the time.